The September project focused mainly on rebuilding the wall between the crew quarters and cargo hold, rebuilding the divider wall between the two aft crew quarters and installing the monitor points on the aft salon deck cabins that are badly deteriorating and on the verge of collapsing. As it turned out, the previous winter damage to the wall between crew quarters and cargo hold was probably a healthy thing for our progress. It forced us to rebuild the wall supporting structures before re-paneling them which probably should have been our plan from the start. These supporting structure improvements are less visible but no less important. 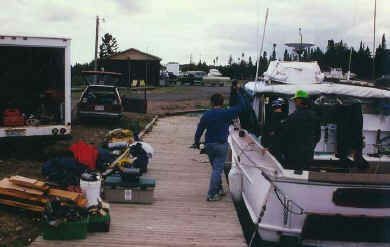 Since the wall rebuild absorbed the major portion of our time the less important more cosmetic tasks were not completed in the crew quarters. All in all, I felt the projects went very well. This years wall restoration results were much better than last years. This is mainly due to the fact that the boards used to rebuild it were still leaning in place and had not deteriorated from being knocked around on the floor for a few years. 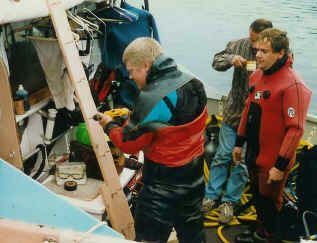 This reinforces to the need to stabilize the ship before rebuilding it to insure that the soft wood stays in place so the edges do not get abraded from diver traffic. Changes made in our diving operations from what we learned last year made the operation much better controlled and safer. 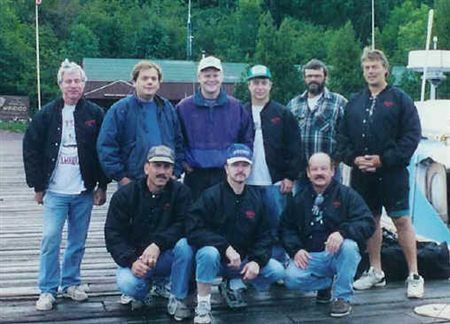 Participants were Ken Knutson, Al Brown, John Nori, Ken Merryman, Dan Gates, Tom Brueshaber, Jerry Provost, Dave Schmidt and Al Lesunov. We are getting better with experience. We now have a large winter effort ahead of us to build the preservation plan based on our documentation. 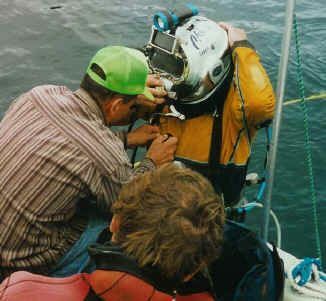 If things go according to the plan, next year we will be doing a "broad brush" coverage of the whole shipwreck, stabilizing the areas which are most likely to deteriorate in the next eight years. It sounds like a long time but we are in this effort for the long haul and we progress as we walk -- one step at a time. Loading Heyboy for project. With just Heyboy and Nobility for work base, quarters were cramped. 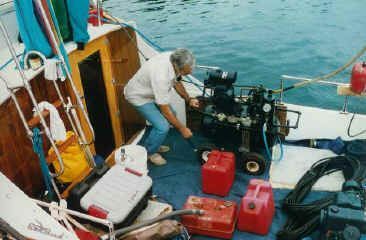 Al Lesunov's boat Nobility was the home of the compressors and pumps. 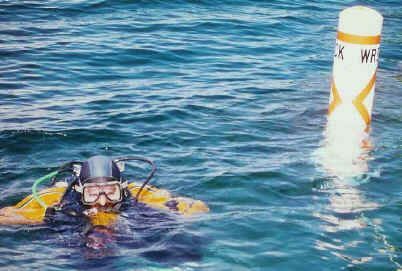 The Heyboy was the diving station. 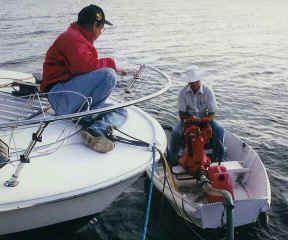 Dan Gates rigs the moorings for the duration of the project. 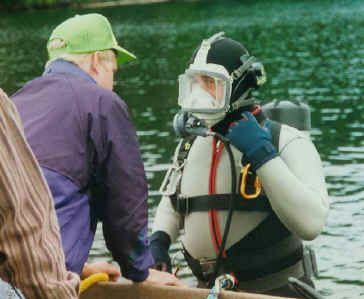 Tom Brueshaber and Dan Gates suit up to start the dredging. The wall we had to move had two foot of silt plus debris built up on its front side which needed to be removed to allow us to move it back into place. Jerry Provost suits up Dan Gates in the hard hat. 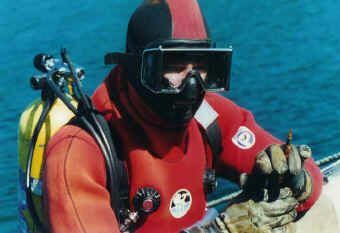 Tom chooses scuba and an aga full face mask. 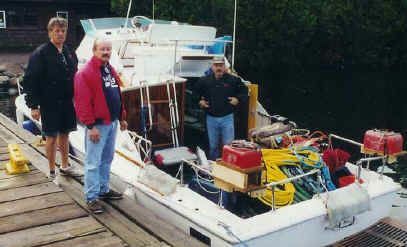 Ken Knutson manned the diaphragm pump for dredging. We hoped it would clog less than the rotary trash pump we used the previous year. Ken Knutson, all around mechanical wizard, was in charge of setting up the compressors and keeping them running. 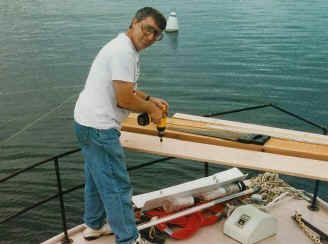 Ken Merryman was project manager plus carpenter and diver. He is drilling the oak lips we added to keep the wall on its base. John Nori adds the bronze screws to the oak lip so the in water work is kept to a minimum. During the dredging we uncovered many artifacts. All artifacts were photographed, measured, and documented. 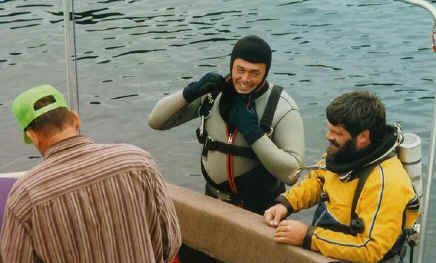 They were kept in water during the project then returned to the ship at the projects end. 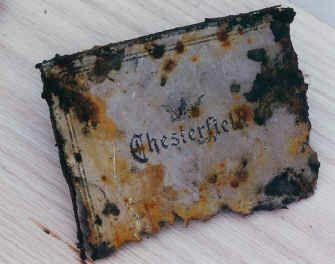 This is a metal Chesterfield cigarette box lid. Although returned after this project, it was eventually recovered in 1999 and professionally conserved for display in our new shipwreck display at Windigo Visitor Center. 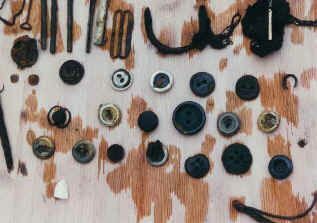 Numerous buttons, buckles, sharpening stones and small artifacts were recovered from the dredge screen output. 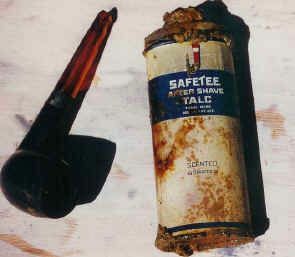 Everything was returned to the wreck site. 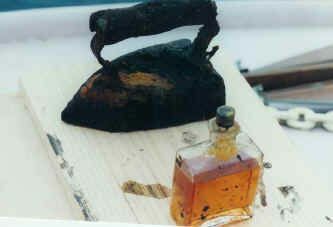 An old electric iron and cologne bottle were among the artifacts. These were eventually recovered in 1999 and conserved. They are now on display at the Windigo Visitor Center. The cologne still had an aroma. Ken Knutson holds an old fountain pen also recovered and replaced during the project. 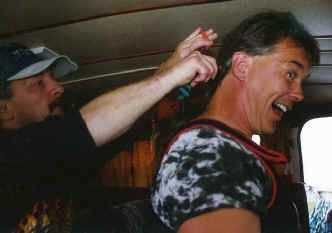 The ceremonial cutting of the pony tail performed by Dave Schmidt on Tom Brueshaber.